“If we, the architects of the West, wish to do great and lasting work we must dare to be simple, must have the courage to fling aside every device that distracts the eye from structural beauty, must eak through convention and get down to fundamental truths.” – Irving J. Gill Craftsman magazine, May 1916. 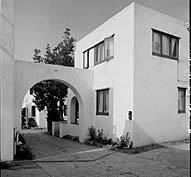 Horatio West Court is listed on the National Register of Historic Places because it exemplifies architect Irving J. Gill's bold use of concrete and hollow tile, a hallmark style that permitted him to construct an inexpensive tilt-wall construction system that still allowed for a great deal of artistic expression. This system allowed Gill to modify the existing California mission style into a simplified modern style. 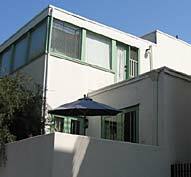 A tireless designer of small-scale, low-cost housing projects, Horatio West Court is a fine example of affordable 1920s. Irving Gill was born in Syracuse, New York in 1870. The son of a building contractor, Gill attended public schools in New York but never went to college. In 1890 he joined the firm of Adler & Sullivan where Louis H. Sullivan influenced his outlook on the need for an "American Architecture". In 1893 Gill moved to San Francisco. Two years later he established a private practice that was highly influenced by the native vernacular and traditional materials of the region. He worked in partnership with W. S. Hebbard from 1898 to 1906 and with Louis J. Gill from 1914 to 1916. In his early California years, Gill practiced a variety of eclectic styles, ranging from Beaux-Arts to Shingle Style to Prairie Style. In 1906, Gill went solo and began to make bold use of concrete and hollow tile, a technique that became one of the hallmarks of his career. He created a relatively inexpensive tilt-wall construction system that allowed for the modification of the existing California mission style into a simplified modern style. Gill’s idea actually started with the military. Colonel Aiken devised a system of casting the walls of buildings in a horizontal position and raising them with special equipment. Numerous buildings were erected at army posts. Gill took this concept to the civilian world using walls that were pre-cast in a horizontal position and raised by motor-driven jacks. The number of jacks used and the spacing of them depended on the weight and size of the wall to be supported. Door and window openings were laid out. Metal jambs set in place and the remaining surface of the wall form covered with hollow tile spaced for reinforced concrete beams to give proper stiffness; twisted steel rods were then placed vertically and horizontally, and the wall was ready to be poured. Concrete was wheeled up an incline, dumped, leveled off and allowed to set. The upper surface (the outside of the wall) was finished in its tilted position before being raised. Putting the walls into place required a 5 h.p. gasoline engine. It took from 1/2 hour to 2 hours was required to raise each wall. Horizontal rods left projecting from the ends of the walls were bound together after two adjacent walls had been raised to an upright position. A form 2" wide was built up the entire height of the wall, and into this concrete was poured, producing a concrete and hollow tile steel reinforced with twisted steel bars. “Ornaments tend to cheapen rather than enrich, they acknowledge inefficiency and weakness. A house cluttered up by complex ornament means that the designer was aware that his work lacked purity of line and perfection of proportion, so he endeavored to cover its imperfection by adding on detail, hoping thus to distract the attention of the observer from the fundamental weakness of his design,” noted Gill. Gill died in Carlsbad, California in 1936.